This morning I stepped on the scale and much to my surprise I weighed about 4 or 5 pounds more than I had at the beginning of last week. I tried to chalk it up to “water weight” (though I’m not sure why this would be the case, but it made me feel better). Then I put on my jeans. Nope, unless water weight attaches to ones rear end and thighs exclusively – I don’t believe it does, for the record – then this was definitely plain old weight gain. Overall, I'm a petite-ish person, and at just about 5 foot even, five pounds makes a big difference – as in it changes my clothing size. Being small, I get a lot of the ‘oh but you’re so little” when I complain about weight gain, and this drives me crazy. Weight gain is weight gain, and very few people enjoy it, regardless of their size. My specific difficulty is the feeling of lack of control. I did nothing out of the ordinary last week. I wasn’t on vacation nor did I dine at the all you can eat buffet every day (just one, and I didn’t quite eat all I could have). So why, suddenly, were the pants that were loose last week now a bit tricky to squeeze into? I’ve touched on my body image and eating issues in the past, but I haven’t gone into a ton of detail. I don’t really think it's necessary for the purpose of this blog either, so I’ll give the cliff notes version. I’ve had body image issues since I was about 16. I’ve always thought I was larger than I apparently am, and I’ve never had much body confidence. I have a tendency towards extremes (this is a common characteristic in people with mood cycling disorders, I’m told) and when combined with a pretty bad fear of lack of control, this can put me in a dangerous place when it comes to my eating and exercise habits. I can get into a situation where I push myself further and further on these, eating less and working out more, which is a self-perpetuating cycle. In addition, I have a history of a pretty severe stomach condition which can genuinely prevented me from eating much without experiencing terrible pain, and this condition gets worse as my eating habits decline - there's a long list of things I'm not supposed to eat and drink, which I follow loosely when I follow them at all. I know, bad idea. What I’m wrestling with now, given this sudden “shrinking” of my pants, is the need to improve my eating and exercise habits, both to fit back into said pants and to appease the increasing pains in my abdominal region. I’ve been admittedly terrible and not paid much attention to my food and drink consumption at all and this needs to change. However, I do not want to fall down the familiar slippery slope, which takes you more quickly than you would expect, from healthy to obsessive (and probably really obnoxious to everyone around me). As a side note, for those who feel that body image disorders are out of vanity, they are not, I promise. They stem from a lack of confidence, and in my case, a lack of control over other aspects of life. When one can’t always control their brain, it’s easy overcompensate by taking too much control over areas, and ones body – including dietary and exercise habits – are an easy target. For anyone that would like more detail on this, I'm happy to expand on my experiences privately. So I have decided to use this blog as my pledge, to be kinder to my digestive system and my body by eating better and exercising more frequently, while truly staying healthy by keeping it balanced with the rest of my life, and not letting it take over my psyche or my personal life. I would love to team up with others (virtually works fine too!) who are looking to be a little healthier in this aspect of their life, to help motivate and encourage each other. If you’re interested, by all means let me know! The other day I did a guided meditation focused on finding your inner child. I do 15 minutes of guided meditation daily and while all of them help me relax and center myself, this one reached me in a way that most of the others have not. I have a vivid imagination, which actually helps when doing these meditations it is relatively easy for me to transport myself into the images and nuances described by the guide. However, I also have a wandering mind that can go off on a tangent at a moments notice, and have to keep bringing myself back to the meditation. So when instructed to close my eyes, let my inner child surface and allow myself to feel the emotions of that child, I was pretty astounded when my body and mind underwent a noticeable change almost immediately. I could feel the excitement and energy in my heart, my mind relaxed and I actually felt a smile come across my face. Now, I know that traditionally the objective of meditation is to remain rather still with a calm mind and heart, but this was about finding the child within you, and what child remains still with a calm mind? So I just let my mind and body react as they did without questioning it. 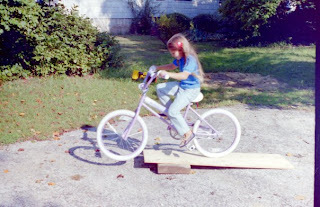 The simple act of “allowing” the child in me to come out brought about this rapid change in me physically and mentally. Pretty incredible. 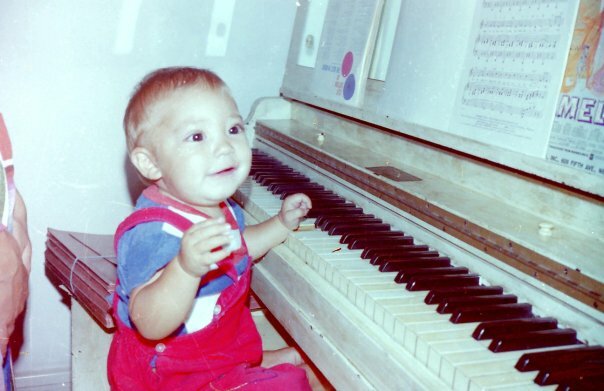 I was a baby Mozart! Not really, but I had fun. I actually tend to see glimpses my inner child quite a bit. I love to do cheesy and cliché things like splash in puddles and dance around my kitchen singing while cooking dinner. I thrive on new adventures and excitement. I’m a fan of pillow fights and food fights (though not necessarily simultaneously), laughing until I’m crying, and tickling wars. Unfortunately, these don’t comprise much of my daily, or even weekly, routine. I’m a travel planner for a living so, needless to say, a lot of my life involves pre-planning. It’s tough to be spontaneous and silly while booking airfare. The airlines don’t appreciate that too much, and probably neither will my clients. When your job revolves around planning, you tend to be someone who plans when not on the job as well (or vice versa, you go into planning as a career because you excel in it in everyday life). Either way, it’s unlikely to be a highly spontaneous person who plans for a living. Not impossible, but unlikely. For those who are successful at this, I’d truly love to hear your strategies. 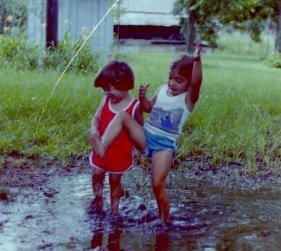 For me, despite the obvious divide between “living in the moment” and planning for a living, I miss my inner child and I wish I could hold on to her longer and more frequently. The meditation got me thinking about my favorite aspects of my younger self. What did I used to do and be that I feel I’ve lost? What do I wish I could learn from the child version of me? As the meditation guided me through these questions, a few key characteristics continued to surface. · Fearlessness: I think virtually anyone would say they were less afraid of things as a child that they are now. Closed in spaces? Great hiding spot. Snakes? Make great pets. Standing on top of a very high mountain and looking down? Exciting, not terrifying. Fears seem to develop when we begin thinking more in depth about a situation – what could go wrong, should I do this or not, what are the long-term ramifications, etc? Children, for the most part, don’t question life in this way very often. Adults probably question things too much, hence the fear development. · Confidence: My biggest fear (other than bees, because I’m allergic) is probably public speaking, or really anything that involves being up in front of people. I don’t like the sole attention being me, and I don’t like feeling like I’m being judged or watched. Yet in third grade I tried out for, and got, the lead in the class play. Through middle school I was a soloist in chorus every year (fun fact: I used to have quite a good singing voice). Yet now, giving a 10-minute presentation in front of a few colleagues requires me picturing everyone in their underwear and I’m pretty petrified of karaoke. It's a fear I make myself work through, and I'm getting more comfortable with it, but I still don't love it. · Freedom: It may seem that I have more freedom now since I own my own business and make my own hours instead of my day being dictated by homework and bedtimes, but we have a lot more worries as adults and put more pressure on ourselves. We often think ten steps ahead (or behind, if we feel we’ve made a mistake) instead of enjoying the moment. While this is helpful in paying our bills and keeping our jobs, it takes away from the day-to-day enjoyment in life. Wouldn’t it be great if we could truly just enjoy the good parts of our day without having deadlines, rent payments and other must dos in the back of our minds the whole time? · Spontaneity: This is a big one for me. I have two sides that often seem to be at odds. As I've mentioned, there’s the part of me that loves planning and organization, but there’s the part of me that wants to do things on a whim, that likes to just jump in the car on a nice day and drive to an un-determined destination, who loves to sing and dance walking down the street until I realize I’m doing it out loud and in public and people are staring at me. I think of everything, this ability to be spontaneous without worrying about being judged by others is what I miss the most. When a little kid breaks out in song in an inappropriate place, it’s funny at best and slightly embarrassing at the worst. When you do it as an adult you can get kicked out or arrested for disturbing the peace, or at best have the people around you thinking our a bit off your rocker. Doesn’t quite seem fair. If you haven’t taken a look at your inner child lately, I highly encourage it. It might be in the form of a guided meditation, or it might be doing something you haven’t done in a long time that brings back good childhood memories. I’ve recently connected with some old friends (i.e. from childhood, not elderly), and it’s helped me a lot. Not only do we reminisce about the old times, but I realize that the same reasons we were close then are the reasons we’re reconnecting now, and it brings out some of the spontaneity, freedom and confidence that I had when we were younger. I’d love to hear others’ techniques for bringing out their inner child. It’s a step that I think is so important for anyone trying to re-discover themselves and rebuild, and I’d love to make it more a part of my weekly, or even daily, routine. In a conversation about my recent decision to open up, a friend of mine commented, “you’re the emotional equivalent of streaking across the field at a baseball game.” I laughed. A lot. Then I realized he was absolutely correct. Recently, I’ve been incredibly forthcoming about my life, my struggles, my thoughts and feelings. What’s amazing to me is the number of people that I never suspected were reading my blogs who are commenting on it to me. Not only are they mentioning it, they’re telling me how much courage I have for telling my story and how much they respect what I’m doing. Wow. Who knew that telling everyone you have a condition that makes you feel crazy at times could get so much respect? I’m truly grateful to these people for reading my posts and being supportive. It means more to me than I can express, and it’s helped me to continue revealing my thoughts and feelings throughout this journey. Despite all of this, there’s one subject I’ve steered quite clear of, and that’s my relationships. I’ll mention my divorce here and there, or the fact that I was in a relationship that ended at a certain time, but I have not delved into the details. For those of you who are expecting some romance novel-esque admissions here, I’m sorry to disappoint. There’s a reason that I don’t go in depth into my relationships. It’s one thing to put myself out there for the world to see, but it’s not fair to bring out the personal details of someone else, especially without their consent. Instead, I bring this topic up for an entirely different reason – it is the first time in twelve years that my world hasn’t revolved around a man. One of my biggest strengths, in fact perhaps my greatest, is my loving and giving heart. While I don’t have patience with myself or with life in general - I’m working on this – I have incredible patience with the people I care about. I forgive, I try to forget, I apologize even when I’m not necessarily wrong because nobody’s perfect and we shouldn’t constantly hold against people the fact that their human. This lends itself well to being in continual relationships, because I’m always getting to utilize my greatest strength. However, it doesn’t necessarily lend itself well to finding myself because I’m often putting the other person first, and I’m always tied to someone else. I was someone’s girlfriend, fiancé or wife for 12 years. I re-arranged my life to fit someone else’s. In fact, in many ways, that defined me. I listened to “x” type of music because my partner did. I partook in “y” type of activity because it was important to the person I loved. I had “z” type of impression of myself, because that’s what the person whose opinion I put my stake in told me. I wasn’t being false, I was just adaptable and often vulnerable, and I put a lot of faith in the men that I loved. For clarification, let me add something – it’s not that it was all give and no take. I loved and stayed with each of these people for a reason (well, probably multiple reasons). However, around the time I turned 23 years old, my cyclothymia, which had given hints of its existence my whole life, seemed increasingly determined to show its ugly face until I was finally diagnosed just before my 30th birthday. During this time, I was struggling to understand myself, and therefore I relied a lot on those around me to define who I was. Not on morals and values (I’ve always been very firm on those), but on just about everything else. Quite simply put, I lost much of my sense of self. Now, at the age of 32, I’m not someone’s girlfriend, fiancé or wife. Not that I disliked these roles - there were some very happy times, and I have never believed in regret, so I wouldn’t have changed anything. But truth be told, I’m not particularly looking to be any of these at the moment. It’s not that I’m bitter or opposed to relationships or to meeting someone that I could share my time with. But right now what I really enjoy being is me. I find that I actually really like myself. Go figure! I love my openness, my quirkiness, my own style and musical tastes (country music IS great, I promise!). I also find that I’m reconnecting with old friends and making new ones easily. Possibly, it’s karma (I don’t believe in fate), but more likely, it’s that the more “me” I am, the more I draw people to me. This may sound conceited, but I don’t mean it that way. Rather, it’s a bit of an eye opener. As you discover who you are, you become more confident and comfortable with that person, and this in turn allows you to meet (and keep) people who you truly value and discover a life that you fully enjoy. I’m not 100 percent back to myself. Honestly, I don’t think we really ever are. Life is a growth process. If we came out of the womb knowing everything we ever needed to know, life would probably be pretty damn boring, and we’d probably be really obnoxious to the people around us. There are parts of my life that I’m still confused about, and I do work every day to push down the negative and boost up the positive. My condition, without any say from myself, can switch my day from great to “ugh” in a short amount of time, and sometimes I just have to deal with it. Still, I am amazed at how just being myself, with no expectations from a significant other and no need to fulfill some essential role in their life, has changed me. It allows me to have faults without feeling sorry for them all the time and without constantly trying to “make everything better” (if you know me well, you know that I’ve always been a chronic fixer and over-apologizer, and truly, I think that's just ingrained in my heart). I don’t have a total wall around myself – I don't say, “I refuse to get involved with anyone, no matter how great they are” because, to be honest, that type of closed mindedness just isn’t me. You never know where life takes you, and I believe in never saying never, but it's just not a goal at the moment. I do hope that once I am fully comfortable with who I am, that I’ll be able to get into a relationship in which I can truly be me and he can truly be him. Until then, though, I am content to emotionally streak across the baseball field, with my best assets and biggest faults out there for all to see, enjoying the moment, and just being me. In part one of this blog series, I wrote about the general's of cyclothymia –it’s symptoms, it’s prevalence, and how it feels for me when I’m cycling. In part two, I have decided to tell my personal background, from the episodes I experienced growing up to being diagnosed to where I am today. It’s the first time I’ve told some of this, so it took a while for me to put pen to paper (fingers to keyboard), write this out and share it. It was emotional and cathartic, and I hope it provides some good insight into my journey. I’ve been cyclothymic all of my life, apparently. I found out I was cyclothymic right before my 30th birthday – not because I didn’t have previous evidence of this, simply because it was just missed. I suffered signs of anxiety, panic attacks and depression for years – most noticeably since about the age of 18, but more likely even before then. My mom said I that I used to get incredibly anxious and jittery as a child and say to her “mommy, make it stop”. Needless to say, “it” is pretty nebulous, especially coming from a small child and she took me to doctors but they were of no help. Knowing what I know now, I’d be willing to put money on the fact that it was a hypomanic episode. In college I dealt with body image issues, anxiety and some depression. Nothing seemed terribly wrong, but nothing seemed terribly right either. I began going to a therapist at school, a grad student doing her internship (or something similar, I don’t remember the details), who I loved. Throughout the years, I went to different therapists on and off trying to find the right fit, always not feeling myself, experiencing ups and downs, but no one could pinpoint it. My moods were attributed to job stress, pre-wedding jitters, post wedding jitters, “grass is always greener” syndrome and other notions that were untrue (ok, maybe the post-wedding jitters, but the rest really weren’t). I tried anti-anxiety meds, and they just made me sick to my stomach, literally, so I stopped them. They didn’t seem to help much anyways. When I was 29, I went on mild anti-depressants to help give my mood a boost – I clearly wasn’t feeling like my normal energetic self, I finally gave in to the fact that something was a bit “off”, and gave the medication a try. After all, I’d been working on this since I was 18 and nothing had really helped yet. At first, I thought the meds were working and I was very excited. They just kind of softened things a little bit – life didn’t seem quite so hard and I felt more light-hearted. Then after a couple of months I suffered a serious of terrible, prolonged panic attacks for no reason at all. By prolonged, I mean hours and hours, sometimes days. I ended up going to the ER, where basically they said they could find nothing wrong with me. Long story short, my anti-depressants were upped, assuming that I was dealing with anxiety, which was causing the panic attacks. The attacks got worse. I went back to the therapist I’d gone to briefly after my divorce (see comment above about post-wedding jitters). 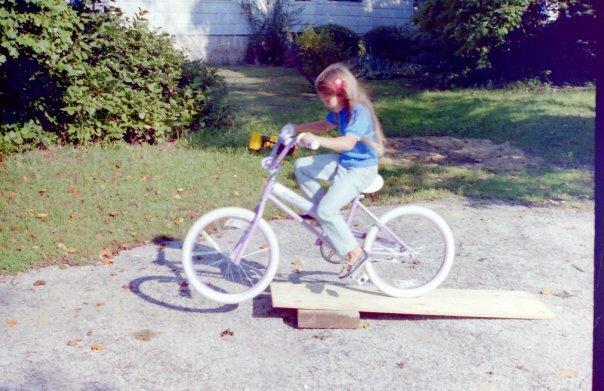 After a few very intense sessions, she told me what no other therapist in 12 years had been able to figure out: I had a mood cycling disorder. I was confused. I was scared. I was relieved. Yes, you read right, relieved. Finally, finally it made sense. Mood cycling. That’s exactly what I was going through. I think I’d known it somehow in the back of my mind all along. The minute she said it I knew she was right – it just made sense. I weaned down on my anti-depressants with my therapist’s help. They’d made me worse because they make hypomanic episodes (they were not panic attacks after all) even more hypomanic. If you think about it, it makes sense – antidepressants lift your mood, and if your mood is already in a high frenzy, that’s a horrible combination. I started my new medication. It made me terribly sick. Not in the hypomanic/depressed way. In the “I feel like I just drank a bottle of whiskey on an empty stomach” way – not that I’ve ever done this, I’m exaggerating to make a point. I had to lie down for hours after I took the lowest dose. They made me nauseous, dizzy, disoriented, you name it. Then, by some miracle, they made me feel better. Slowly, very slowly, I started to notice a leveling out. Just in time to up the dose, because with side effects like these you never start with the dose you’ll actually be on, but work your way up. The side effects started again. This time I was more prepared but it didn’t make it much easier. I went through this dose increase multiple times. Finally, I ended up at my current dose. I’ve been on it for about a year and a half now. I hope it stays at this level, but I truly have no idea if that will be the case. I still go to therapy, as my therapist has to monitor my meds and my moods, and I have to get blood work to ensure that the meds aren’t messing up any number of things these meds can mess up. Plus, to state the obvious, I’m still cyclothymic. That will never change. I’ll be on medication for the rest of my life. It’s something I’ve had to accept. In fact, it’s something I’ve become grateful for – there are meds that can make this much better. It’s not ideal, but it could have been way worse. I still have ups and downs, and I always will. I have learned how to recognize when these cycles are coming on, for the most part. I have tricks to deal with them, and most of the times these work. I also have learned to deal with the fact that sometimes these tricks won’t work and I’m going to have a really bad day of ups and downs, confusing and frustrating myself and probably those close to me. I don’t like this last part, but it’s unfortunately one of those things I can only control so much. The good thing is, I know the cycles won’t last for long (per the rapid cycling). There is honestly some comfort in that, if I can think about it logically when I’m going through it – which is obviously easier said than done. So that, in a bit more than a nutshell, is my cyclothymia story. It’s where I’ve come from and where I am. It’s what I deal with every day. The good news is this: I have a good life. I own my own travel company (how cool is that! ); I live in the city with my dog and I love it; I have a great network of supportive friends and family; I am now working to raise mood disorder awareness and education, as well as looking for additional ways to provide support for those with mood disorders. I hope to eventually turn this into something bigger than just a passion of mine, a blog and a small Facebook group. Do I wish I’d been diagnosed earlier? Absolutely. If nothing else, it would have made life easier on those around me who understood even less of what I was going through than I did. Am I thankful that there is medication and treatment that can help me to live a normal and life? Without a doubt. And that, when it comes down to it, is all that I can ask for.